Best in show, but rational human beings, should spend £200 less on 6GB of standard DDR3. Latency, baby. That's what gets you hot, isn't it? With the DDR3 arms race getting especially messy in terms of frighteningly high clock speeds at the moment, OCZ has turned to super-low latency. It's 6-6-6-24 on this sphincter-clenchingly expensive 6GB, 1,600MHz-rated triple channel kit, designed speciﬁcally to pair up with an i7 chip. But does that bump from the more prevelant 7s and 8s genuinely offer a boost? Unless you're rocking one of the Core i7 Extreme Editions, you essentially cannot set RAM speed independently of the host bus – something to bear in mind if you're wanting to achieve that 1,600MHz ﬁgure with a humble i7 920, and its maddeningly locked uncore. A serious overclock (or a few steps down on the CPU multiplier) is the only way to hit the high notes for this or any other 1,600MHz+ DDR3. Which, really, is the point of these sticks anyway – an elaborate but refreshingly thin, low-proﬁle, heatsink/ spreader opens the door to more overclocking headroom. It looks good and it leaves more space between the sticks and in the case, so it's deﬁnitely going to appeal to enthusiasts. We almost reached the mythical 4GHz with our test i7 920, the RAM running happily at over 1,600MHz and that spooky 666 latency. Unfortunately, the latency made for very little difference on a practical level. Inevitably, synthetic benchmarks such as Sisoft Sandra show a dramatic spike in memory bandwidth – 3Gbps more than on our 8-8-8-rated comparison sticks – but essentially diddly-ﬂippin'-squat in World in Conﬂict. If you're looking for a meaningful out of the box performance boost, this is not £300 well-spent. But then, it's not aimed at someone who works that way – as attested to by the fact you'll need to get down 'n' dirty with voltage tweaks to even reach post at the listed latency. The RAM needs at least 1.65v and the QPI at least 1.3 – both well within safe margins, but more than an X58 board's BIOS provides by default. It is, then, a component that's as much about willy-waving as it is about actual performance. For sure, it's what you want if you're running an i7 Extreme Edition and want to achieve the highest possibly synthetic benchmark scores. For most of us, however, 6GB of 8-8-8 1,600MHz DDR for half the price will offer more or less identical real-world performance. 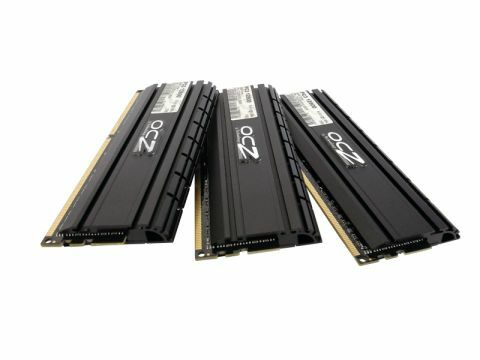 DDR3 in general is leaving its former sky-high prices behind and overclockers will get the best out of it, but our advice is to hang on until RAM of this spec is a little more commonplace, and thus cheaper.